William & Humbert Bodegas, Jerez de la Frontera, Cádiz, Spain (although the base spirit is made by Langley Distillery, Birmingham, England, UK). Botanic Gin and William & Humbert Bodegas. The winery was originally founded in 1877 by Sir Alexander Williams and Arthur Humbert and concentrated on producing Wine, Brandy and Sherry. Alexander Williams was an admirer and connoisseur of sherry and in 1870 moved from England to Spain and worked for a winemaker where he learned about Sherry production. During this time he met and married Anny Humbert, also from England, and her brother Arthur Humbert who was a specialist in international relations. Together Williams and his brother-in-law Humbert built a company, their original and modest business building is still part of the operation today, but over the years this has been added to including hectares of vineyards and one of the largest cellars in Europe. José Medina y Compañía was established in the 1960’s by José Medina and within a few years was joined by his brothers Nicolás, Jesús and Ángel. They created their own winery in Jerez and concentrated on international Sherry sales. By the 1980’s they had established themselves as one of the leading sherry suppliers across the globe and started acquiring different brands including in a 100% share in William & Humbert Bodegas in 2005. Today the second generation of the Medina family runs the company, selling their products in over 80 countries, with an annual turnover in excess of $60 million. Their key brands include: Canasta, Gran Duque de Alba Brandy, DrySack Sherry and Dos Maderas Rum. The base spirit for this Gin is made using English wheat and is distilled three times in copper pot stills by Langley Distillery, Birmingham, England. The base spirit is transported to Andalusia, Spain where it is distilled for a fourth time with Spanish botanicals. The Gin is presented in a cobalt blue colored glass (almost) cube-like shape, said to represent a large ice cube, with a large silver top. The bottle has images within the glass of Buddha (back and front) and on the sides are images of the Buddha’s hand tree. This cuboid shape is certainly eye catching although it is a little difficult to pour. $$$$ - $$$$$. Readily available in Spain and may be purchased online for shipping worldwide from the following Spanish retailers: E Buy Wines, Smart Bites, Vinus Vinis and Grau Online. It can also be purchased from Master of Malt in the UK but be prepared to add a further 40% for shipping outside of the UK. Uses 14 botanicals (thought to all be grown in Spain) including: almond, anise, Buddha’s hand, cardamom, chamomile, cinnamon, coriander, juniper berries, lemon, mandarin, mango, orange (sweet), peppermint and thyme. 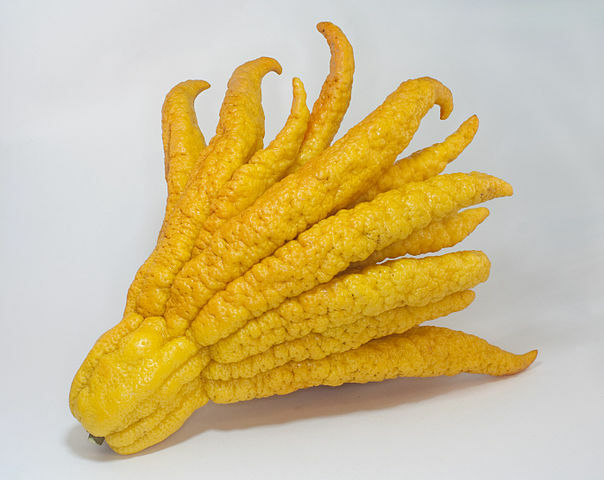 The unusual Buddha’s hand is a citrus fruit (an ancient variety of lemon) with long “cells” making them look like fingers. Originally from Indo-China the botanical named Citrus medica has little to no pulp or juice inside and is used for it’s peel (zest). It is very fragrant and is often used as an air freshener (particularly in China and Japan – where it is known as “bushukan”). Buddhist’s use this as a lucky charm for happiness and as a religious offering in some ceremonies including as a New Year’s gift. Unknown but the use of 14 botanicals is a reasonably high number compared with the majority of Gins, so the name is a good fit with the ingredients. On the nose is citrus including lemon and orange notes, with hints of piney juniper and almond. On the palate this softly smooth spirit has juniper and citrus with spice (coriander and cinnamon) and earthy herbal (thyme) notes developing including nutty almond, floral chamomile and sweet liquorice (anise) & orange. On the long close is floral orange blossom and dry juniper with a peppery (cardamom) finish. Like it’s sibling the original Botanic Gin, this is a subtly styled London Dry. It has increased citrus notes and may be drunk neat (with ice and a citrus garnish – especially orange). It is certainly at home in a Gin and Tonic where the citrus notes come into the fore, although a stronger ratio of 2 or 3:1 is preferred us, along with a playful garnish of orange, juniper berries and a green cardamom pod or two. It is ideal for a hot summers day where one can almost lie back and envisage a sun-drenched beach and clear blue sea (it feels so reminiscent of the Mediterranean). Yet to be tried by us, we have heard using Schweppes Ginger & Cardamom tonic water (with a lime garnish) works very well indeed but also consider Fever Tree Mediterranean or even Thomas Henry Elderflower - let us know your thoughts if you manage to try any of these. This Gin does work in a Martini but it needs to be a dry one. The vermouth nicely supports the thyme, and the garnish can be chosen according to the emphasis you wish to create but an orange twist works very well for us. The floral aspects of the Gin seem to be quite at home even though this is not a usual experience for a Martini; again it is reminiscent of the Mediterranean but this time of sitting on the porch of a mountain side café with a gentle breeze blowing. A curious Gin in having elements of a light London Dry Gin and the subtle complexity from the number and variety of botanicals. It certainly tries to be many things to many people and sits best for new Gin drinkers and those who seek less juniper than usually found in a classic London Dry Gin. Compared with its sibling the original Botanic Gin there is a greater and better balance between the citrus and earthy notes. This also has similarities to another Spanish Gin, 7d Essential, using many of the same botanicals and creating a similar Mediterranean feel.